» Who Will Be the First NBA Catfish Victim This Season? Paul George set the tone last year with a rumored catfishing scandal. Trey Burke reminded us last week that NBA players, too, can be subjected to an iCloud hack (or something). Online scandal awaits basketball players. Today we ask: Who will be the first victim of a catfish hoax this season? Jason Concepcion: Talking about sports can sometimes involve being, for lack of a better word, mean. It requires squeezing a few petty chuckles from the misfortunes of another, be it an airballed free throw, a hairline that retreats and advances like the front lines at Antietam, or starting an unfortunate quasi-romantic relationship with an invented online personality. That being said, when trying to decide which NBA player will be the first to be catfished this season, I think you first have to quantify what it is that makes a person susceptible to such things. In my mind, that would be youth, inexperience, a certain naïveté about life and love combined with the brain-addling thirst of the loins in peak bloom, and a casual ease with technology born out of being a native of the Internet age. And perhaps a lack of industry connections with which to cover up said virtual tryst. This means: rookies. After an embarrassing amount of deliberation, my pick is incoming Magic rookie Aaron Gordon. Man 18 years old with a new apartment in Florida is not a bad way to be a teenager. My case: Gordon is 18 years old, untethered from familiar surroundings and the emotional and moral support of family and friends. He now lives on an unfamiliar coast in a noted nightlife state and is making about $4 million a year. In other words, like any normal teenager living away from home, the dude is a ripening nexus of possible bad decisions, only, unlike most college sophomores, he’s also independently wealthy. And, anecdotally, it feels as if Florida is some sort of magnifier in (potential) situations like this. Florida usually means trouble. Daniela Rajic, the former exotic dancer who is (allegedly) the mother of a child with (alleged) catfish victim Paul George, plied her craft in Miami. So, with regard to Gordon, what could go wrong? I don’t know, probably a lot of things! I humbly submit as evidence for your consideration this tweet addressed to Brittany Renner, fitness model and possible mother of a love child with Colin Kaepernick. It is like something they warn incoming players about at the NBA Rookie Transition Program. It is an arid desert vista of parched thirst in a dozen words, plus one hand-wave emoji. Juliet Litman: First, let’s talk about who is catfish-ineligible. There are some players who have demonstrated such rarefied social behavior that plebian high jinks like getting catfished just do not apply. For example, if text messages surfaced between Dwight Howard and someone using an alias, would anyone be truly stunned? I’d be a little surprised that Dwight knew how to read DMs or Facebook messages, but not that he was hollering at a stranger who may be fake. I think Dwight’s child-to-mother ratio (currently at 4-to-4 as far as we know) suggests his social life is just not like yours or mine. And a quick look at his Twitter feed makes me wonder if he has personally ever used any social media platform. Maybe he’s too busy demanding millions of dollars because of a supposedly violated gag order, or just eating Skittles. The ceiling for scandal with this guy is so high that a catfishing episode would barely register. On the other end of the spectrum, there’s someone like Joel Embiid. He is so active on Twitter that it’s almost as if he’s inviting someone to mess with him. If he’s popularizing phrases like “slide into my DMs,” then he’s probably quite familiar with the messages tab on his Twitter app. Given all the free time he has now and for the foreseeable future, it’s not hard to imagine a rich 20-year-old responding to and sending some Twitter DMs. If we’re prognosticating based on the law of averages alone, he’s bound to converse with at least one catfisher. These high-profile guys are not at risk. It’s the guys on the verge — the 2013 Paul Georges of the league — who we need to worry about: the ones who entered the league with relatively minimal fanfare; the guys with a lot of money, but not all the money. It’s the players like Andre Drummond who are at risk. He has tasted fame but he’s thirsting for more, and it doesn’t hurt that he plays on a losing team. He needs some easy wins, and where better to find those than on Twitter. I’m officially worried about him. His failed romance with former Nickelodeon actress Jennette McCurdy is well-documented on this website. We already know he views Twitter as a viable platform to meet a paramour. Just because Jennette didn’t turn out to be his one true love, it doesn’t mean he’ll stop looking on Twitter, right? It turns out that social media pimping is kind of his thing, with evidence (kind of) spilled onto Wikipedia at one point last year. Yes, any random bored person could log this potentially libelous update. Wikipedia bots promptly scrubbed it for lack of any proof, but I venture that the bots just didn’t deem his Twitter feed sufficient evidence. Look a little closer (which I have done to a potentially alarming degree) and there does seem to be a young man chatting it up with “numerous women.” The troubling aspect is that it seems a girl needs to do very little to get Dre’s attention. Look at this exchange, for example. What are you doing, Dre?! 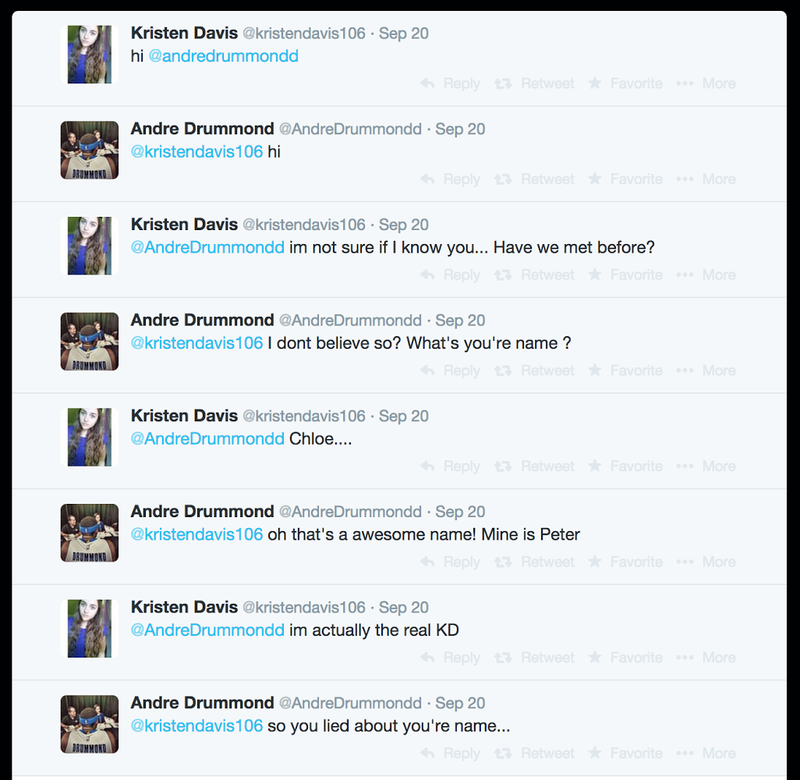 There’s no reason to respond to “Kristen” a.k.a. “Chloe.” This is a catfish danger zone. Kristen/Chloe could be anyone. I’m not sure what he’s thinking here, but I also have no explanation for why he’d ask his followers to make him paintings, unless it’s just a means to sustain conversations with the Kristens/Chloes of the world. Drummond’s entering this season in a precarious state. Fresh from the gold-medal victory in Spain with Team USA, I’m concerned he’s feeling himself a little too much. Drummond’s fashioned himself a “half court shot king,” he’s anointing a new big three (which cannot possibly be true, because it includes perennial underachiever Josh Smith), and he’s applying Jay Z’s most self-aggrandizing lyrics to himself as he walks into a restaurant well known only to the Top Chef heads out here. This kind of hubris, combined with a predilection for social media, seems dangerous. We should send Nev to Detroit preemptively.